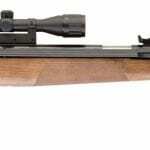 We review lots of pellet guns on this site. Because of that, I’ve tried a whole lot of different types of guns, different brands, different styles, different power sources, etc. Of course, the question becomes: which ones are the best? Which guns do you think are worth having? Well, it’s not easy to narrow something like that down. A weapon is best suited based on what you plan to use it for, what you’re comfortable using, your strength and body type, and a whole lot of other factors that could have a remarkable impact on how you shoot. That being said, there are a few guns that I think are all-around great investments that will work for most people. Here are our favorite pellet guns available today. I keep trying out new models and brands, but I keep coming back to my old RWS Model 34. Rheinisch-Westfälische Sprengstoff-AG is a German company that is marketed by a Swiss company, though I can’t imagine that their marketing is a lot of work. Basically, they point out that the weapons are German design and manufacture, and that’s all that’s necessary. And quite frankly, that is all that’s necessary, because all RWS models live up to the stereotype of German craftsmanship, especially the Model 34. Let’s start with the stock which is absolutely gorgeous with very strict attention to detail. It feels good in the hand, which can grip it fairly naturally. The T06 trigger is light and easy to pull, but it breaks very nicely. I hardly had to think about the mechanics of pulling a trigger when I was holding this, the whole design of the gun made proper shooting very natural. In fact, everything from how you hold it to how you sling it feels natural which is the sign of an incredible design. This also happens to be one of the most accurate rifles I have ever had the pleasure of shooting. It comes with open fiber optic iron sights, which sounds a bit strange but are actually pretty remarkable. Even without a scope, from a standing position, you’ll be able to get some great shots off and it’s even better if you’re using a bench rest. An experienced shooter should have no problems stacking pellets once they do attach a scope and sight it properly, which doesn’t take very long at all. The scope that comes with it is very good for a factory scope and does a great job at helping to account for drop at various yardages. It has a very short breaking in period, and I don’t understand how they can do that when so many other companies make you blow through hundreds of pellets before the gun is ready to use. One of the things I love about working with an RWS rifle is that they back their product for life. If something breaks or needs to be replaced, you call them and they will send you another, no questions asked. Thinking this not true, I asked a question: how could they afford that? They told me that their reputation is worth more than any number of parts. I can say it works, since they have a customer for life in me. There are other RWS models out there, and they’re all very, very good, but I feel like the Model 34 is their flagship weapon, the thing they’re best known for and that they put the most effort into. This is the sort of weapon that you would expect to have to save for, but it’s really not even that expensive, sitting in the low middle of the price chart for quality air rifles. 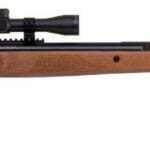 If you want an air rifle that you’re going to enjoy for life, this is the one to get. As you get more experienced, you’ll learn to appreciate the subtleties of this rifle, but even just starting out you have something that you can easily use to target shoot or hunt to your heart’s content. This was my first PCP gun, and it’s still my favorite. Mostly because it’s an incredibly solid gun, one that you can count on to get the job done and get it done right. What stands out about it is that while it can be finicky at times, that very quality also makes it easy to customize to your specifications, which is not something that every gun can do. To start with, the charging mechanism on this works quickly and easily. Just hook up a scuba tank and fill it to the recommended levels. You’ll only get about 20 shots out of that, but they will be incredibly powerful shots. They will be shots that will be very accurate from quite a distance away. Shots that make sure your prey will die quickly, if not instantly. If you don’t have or want to carry around scuba tanks for charging, you can also pump it by hand, but this can be exhausting. A lot of people don’t like the weight on this gun, which can be up to 10 pounds when fully charged, but I think it makes it feel more solid. I know I can bang this gun around a bit tromping through the woods and not have to worry that I will break anything. The weight also makes it a lot more accurate since it sits better in your hand. As far as accuracy goes, you really can’t beat this. Like the Model 34 above, you can do some spectacular things with this gun once you have it zeroed. And it holds zero incredibly well over time and use. On the scale of PCP guns, this is one of the best, but on the scale of pellet guns, it’s still one of the best. If you’re looking for a weapon you can trust, go with the Benjamin Marauder. Not every gun is for every person, and no matter how many pellet gun reviews you read, there is always a dissenting opinion. But based on my research, these are two incredible selections that most people will get quite a bit out of. I see information describing SCUBA rather than SCBA tanks being used to recharge a Marauder PCP rilfe. In fact, SCBA tanks are the preferred recharge air source since they can be filled to 4500 psi instead of the 3000+ psi of a conventional air cylinder and since the Marauder can and is recommended to be charged to at least 3000 psi, you just can’t get there with a SCUBA tank. There needs to be a differential pressure above that of the rifle if you want to fill it to the recommended value so seriously consider using a SCBA tank if you want to get the most performance out of this model. Besides, Benjamin offers a SCBA recharge air fitting accessory that won’t readily fit a SCUBA tank as the plumbing fittings are quite different.